A clear, moving first-hand account with pictures of the opening of Archbishop Dmitri's grave and coffin and what was found inside here. The re-interment was held March 4-5, 2016 in Dallas, Texas at St. Seraphim Cathedral. The article was published March 7, 2016. We often do not know the true value of something until we have lost it. This is particularly true with some men, whom we love and delight to honor in life, but only after death are we able to assay their true worth, thereby coming to know how much we took for granted while they were present and how much we have lost when they are gone. On this feast of the relics of St. Dmitri of Rostov, I essay with fragile words to raise a modest monument to the memory of a priceless man recently departed from us, who had St. Dmitri for his patron and was founder of both a cathedral and a diocese, whose worth proves to have been greater than we knew while he lived. I knew Archbishop Dmitri for thirteen years. I met him the same weekend I met my future wife at St. Seraphim’s Cathedral in Dallas in the summer of 1998. He performed my betrothal. He baptized my first two children. He ordained me a deacon on a week’s notice on the summer feast of St. Maximus, 2000. He ordained me a priest on two weeks’ notice on the last day of the millennium. He sent me to start a new mission in Denton, Texas, home to his alma mater, in June 2001 and appointed the first liturgy to be served on July 29. He chose St. Maximus as our patron from a list of six possible names I suggested to him. The first year when we averaged twelve in attendance at the Divine Liturgy, he encouraged me by relating how in the first year of the Dallas cathedral in 1954, they averaged only six. When minor conflict arose in the mission and I encouraged those who were dissatisfied to go speak with him, he listened to the disgruntled graciously but supported and encouraged his priest. When I erred, he corrected me—though on one or two occasions, it was so gentle and I so dense that it took me months to realize that his comments were directed at me. He taught my wife’s catechism class, leading her from a newly-found rudimentary faith in Christ to Baptism in the Church. He gave her much excellent advice in difficult matters requiring discernment. First, when she was preparing become a novice at Our Lady of Kazan Skete in Santa Rosa, he chanelled her enthusiasm and carefully guided her to where she was ready to become a novice. Then, after she met me and was not sure what she should do with me or her plans to be a nun, he had her go ahead to the monastery anyway for four months, so that if she did choose marriage, she would not in difficult moments look back with regret for not having gone to the monastery. He instructed her to focus her prayers on discerning and accepting God’s will, not on a man or the monastery. (Incidentally, while there, she received the best possible preparation for becoming a priest’s wife under the capable direction of Mother Susanna.) After the monastery, when we had rocky moments in courtship, his counsel saved us from relational shipwreck. When she sought to know what her role should be as a new priest’s wife, he strongly counselled her to take care of her husband, because no one else would, and to keep out of parish politics, off the council, and away from the annual meeting—advice which has kept our marriage and ministry strong. And in later years, with a smile he would claim credit for getting us together. He radiated warmth and love to his people, and they reciprocated, delighting to follow his guidance out of their trust and love for him. He actively worked to get people together to build Christian community, cooking and hosting numerous dinners at his home for parishioners and sundry, conveying deep pleasure in being with his people and in them being together. (I was a guest at one of those gatherings the first weekend I met him, which made a strong positive impression on me.) After services, he always joined the faithful in the hall for coffee famously strong and robust fellowship. He was gracious to everyone, a true gentleman. Whether he liked you or not, found you engaging or annoying, he always made you feel special and welcome as a desired, honored guest. Though easily approachable and accessible, he knew how to keep himself from being consumed by minutia and distracted from important work by unwanted interruptions. He kept his telephone unplugged except when expecting a call. To make an appointment with him, you had to go through his secretary or catch him after services. He kept to himself in his house working, where very few dared disturb him, except when he emerged to be with his chancery staff or the parishioners of the cathedral. Though he was often unavailable to see on a whim, when he was available, he was fully present, engaged, engaging. People crowded around him, drinking in his words and finding nourishment in his presence. He had the ability to carry a conversation graciously without letting you feel like he was dominating it, and if you wanted an appointment with him to talk about a particular matter, you had best come prepared to address your concerns proactively lest you ended up whiling away a pleasant hour in edifying discourse without getting down to business. So stimulating was it to hear him, you were loath to interrupt him. When in town, he always attended the Russian Liturgy that he had me serve once a month at the cathedral for the Russian-speakers, bolstering the choir by singing bass. 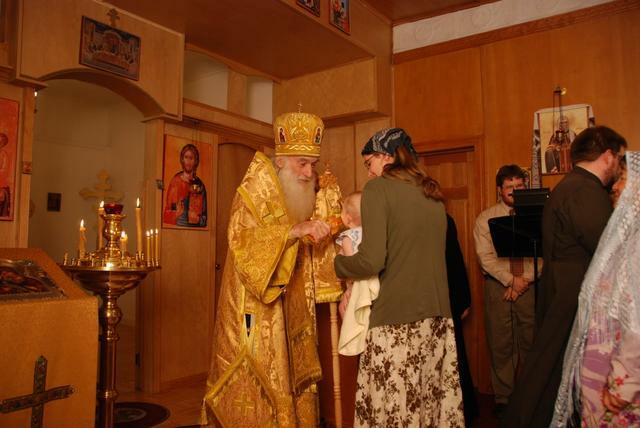 A couple times when I could not serve, he served the Russian Liturgy in my place, which he was fully competent to do. Though a proponent of an American Church, he was not afraid to allow services in languages other than English. Besides the Russian Liturgy, he served a monthly Spanish Liturgy, Spanish being the specialty which he taught for years as a professor at Southern Methodist University. With the Russians, he was careful not to allow two separate, unconnected parishes to develop in one building. He wanted the body of the faithful to be one, to be united, but in wisdom he recognized the need to minister to them in their own tongue as they assimilated to Church life in America. He prepared and hosted a dinner for the local Orthodox clergy association every Bright Tuesday. He diligently promoted the close cooperation of the Orthodox clergy of all jurisdictions in Dallas and Forth Worth, and towards the end of his life, was most gratified that he had been able to get Metropolitan Isaiah of the Greek Archdiocese, Bishop Basil of the Antiochian Archdiocese, and himself to serve together on the Sunday of Orthodoxy for several years in a row at their respective cathedrals. The Orthodox clergy of Dallas and Fort Worth, regardless of jurisdiction, regarded him as their own bishop. He did not belabor the cause of Orthodox unity in North America with words; he built it by his actions. On Wednesday nights after Vespers, he taught a regular class which invariably treated the Scriptures for all who desired to attend. For several years he also taught a special class on Thursday nights for men who might one day serve as readers, subdeacons, deacons, and priests, teaching Greek, Theology, Liturgics and dispensing pastoral wisdom. He poured himself into those who were receptive, not considering teaching a small group beneath him or the time spent a loss. His great love was the Scriptures and the One to Whom they pointed, Jesus Christ the God-man, always teaching from them in his classes, studying to show himself approved, rightly dividing the word of truth, and always working on writing another biblical commentary. He burned with desire to share the fullness of the Christian Faith with the people of the South, and the personal witness of his life and words were responsible for many people finding the fullness of Christ in the Orthodox Church. Another great love of his was language, and he loved to discuss it both in detail and by way of punctuating his discourse with etymological observations about words in English, Greek, Spanish, Russian, Slavonic, and Japanese, this last which he had learned in the army during the Second World War when he served as an interrogator of Japanese prisoners of war. He was passionate about good liturgical language and accurate translation. Coming to the Diocese of the South, St. Seraphim’s Cathedral in Dallas in particular, from the Diocese of New York and New Jersey and St. Vladimir’s Seminary, I was initially discomfitted by the difference in translation, as I had nearly memorized the services in the standard OCA translation. But over the years, as I wrestled with Abp. Dmitri’s translation, queried him and even challenged him on it, pondered it again and again, and studied it for myself, I found that in every significant case I investigated, his rendering was preferable for its accuracy. To take one small but deeply meaningful example: the priest’s exclamation before the Lord’s Prayer. The translation in Divine Liturgy Book of 1967 reads, “And make us worthy, O master, that with boldness and without condemnation we may dare to call on Thee, the heavenly God, as Father, and to say: Our Father...” In response to that translation, which he considered to be a inexcusably sloppy, he released his own Priest’s Service Book in 1973 (which Bishop Basil appears to have followed closely in his own Liturgicon). His translation is the same except that he inserts “vouchsafe” in place of “make us worthy”, “upon” in place of “on”, and more importantly, at the end, he has “the heavenly God and Father”, there being no ‘as’ in the text. The verbal difference is small, but the theological difference is not. Vladyka’s translation allows us to apprehend more accurately who it is upon whom we call: the Heavenly God who is by nature Father of His only-begotten Son, whom we have no natural right to call “our Father’, and whom to call “Father” is blasphemy. It is this God who is a Father who has condescend to allow us to address Him as “our Father” by adoption through Baptism. The 1967 translation obscures here the eternal fatherhood of God, prematurely focusing on how we address him as father by inserting the word ‘as’. When I questioned His Eminence about why his translation did not say “as Father”, which to me at the time seemed more emotionally satisfying, he simply smiled and said, “Because the text doesn’t say that.” His faithfulness in conveying the text accurately has made that portion of Liturgy much more profoundly moving than ever it was before. The Incarnation of Christ was a most important theme for Vladyka in his preaching. Early in his priestly career, a mentor, a bishop, I think, whose name I don’t remember, had told then-Father Dmitri that in every homily, whatever the text, he must somehow, in some way, bring it around to the incarnation of the eternal Son of God. Father and later Bishop Dmitri endeavored to do that, and he passed that counsel on to his clergy. Emmanuel, “God with us,” by becoming incarnate in the Person of Jesus Christ, changes everything for the human race: sin and death are overcome, life imparted, God and man reconciled, and man is destined for glory. The Church proclaims this truth most dramatically at Great Compline when she sings: “God is with us, understand all ye nations and submit yourselves, for God is with us.” Christ presents the world with a decisive choice: be rational and submit to the One who has earned kingship over the human race by His service and self-sacrifice or be irrational and persist in self-destructive rebellion. Vladyka never tired of this glorious theme, and at our Diocesan Assembly in 2006, he suggested that the real problem of the Protestants was they did not have a full understanding of the Incarnation. Troubled by the spirit of our times, he warned us repeatedly of two great threats to the Church. The first was secularism, which he defined at the Diocesan Assembly in 2004 as ‘treating this world as an end in itself.’ Acknowledging that the Church has always labored in evil times in this fallen world, he contended that in our so-called “post-Christian era”, our task of proclaiming Jesus Christ in whom is eternal life for the world is even more difficult than it was in the past since this secularism now runs rampant. If we in the Church are effectively to counteract it, we must deepen our faith and our bond of love with one another. The second threat which he perceived was resurgent Islam, which in his assessment was motivated by the spirit of antichrist “which is already in the world” for its explicit denial of Jesus Christ as the Son of God. He did not dwell on this threat, but I heard him mention it many times. Much as Christ grants man to respond to Him in freedom, Vladyka Dmitri reposed great confidence and trust in his priests. He expected them to act like mature Christian men, to be responsible, and to do their duty faithfully. He assumed the best of them unless they proved otherwise, giving them room to sink or swim on their own. He might be faulted for not providing more oversight and direction than he did: I certainly wished at times that he would be more forceful and directive. Yet the wide scope he gave us allowed us to take initiative, to exercise our gifts, and to carry out our ministries without being laden with arbitrary demands, excessively detailed instructions, or unnecessary administrative burdens. Though he never cited the great abbot, he might as well have had the adage of St. Moses of Optina to guide him in his direction of his clergy: in regards to how to carry out the mission entrusted to you, “The job itself will show you”. Plenty of us learned on the job how to found a mission, not out of a manual. He was a father to us and to his diocese. He was neither heavy handed nor a petty tyrant. He did not micro-manage. He was no mercenary or hireling, but a true shepherd and father whose ministry bore much good fruit. When he began as the first bishop of the fledgling Diocese of the South in 1978, there were only sixteen parishes in the region that stretched from Virginia to New Mexico. By the time he retired in 2009, there were nearly seventy parishes and missions (now there are seventy-two—and three monasteries). It was a joke that all it took for him to start a mission was “two old ladies and a telephone booth” (congregation and meeting place). Some missions were attempted and failed, but many others were attempted and succeeded, proving the adage “nothing hazarded, nothing gained.” All this was driven not by love or glory or desire for gain but by his love for Christ and the compulsion he felt to share Christ with those who knew Him not all or only knew caricatures and distortions. He protected his flock from Church politics and kept us focused on Christ, the Gospel, and the Great Commission. He understood the Church’s true ecclesiology: the bishop rules his diocese and orders its life. He is accountable to the Metropolitan and his brother bishops of the Holy Synod, but they have as little right to interfere in his ‘sovereign diocese’ (a term he used in his publication The Dawn, for which he drew ridicule from some quarters) as he has to interfere in theirs. He understood the proper function of the chancery office in New York to be the necessary support of the special office and functions of the metropolitan as primate and rejected the notion of a centralized national Church run from a distant headquarters, knowing from experience that the fruit-bearing life of the Church is found in the parish and the diocese and cannot be cultivated by central administrators. When administrators from Syosset tried to usurp his authority, such as appealing directly to his parishes for money instead of going through him, he politely but firmly pushed back to protect his diocese. While he did not forbid us to take up the collections for the causes of the “national church,” he did not ask us to take them up—in fact, he never mentioned them at all. He practiced what he preached and led by his example. He preached tithing, but he himself gave his ten percent and more. Far from the highest earner at the Cathedral in Dallas, he was most years among the top three givers. He put his money where his mouth was and stored up treasure in heaven, not on earth. His “episcopal palace” was a two-storey duplex badly in need of repair: he lived upstairs, and entertained downstairs. He drove a old brown bomb of a car from Detroit. When we started the mission in Denton at his direction, we had all of ten adults—including the priest and his wife—only four of whom were gainfully employed. Vladyka appointed me a stipend of $2000 a month, $833 to come from the diocese, $833 from the cathedral in Dallas, the rest from the mission. He wrote the first check in full for me on his own personal account, demonstrating to the diocesan treasurer his commitment to support the new mission. This arrangement turned out to be an early step in developing the present innovative system of financing missions and parish improvements in the DOS. Vladyka Dmitri inspired us with love for God, with love for the Church and her services, and with genuine love for him, though the last was not his intent. We trusted him implicitly, and he did not betray our trust. His example, his faith, his love, made us want to be better than we were. He rarely issued commands, but his very presence and suggestion was more than command for most of us. We followed him out of love and trust, not out of fear, compulsion, or manipulation. He never had to remind anyone, “After all, I’m a bishop and you should respect me and obey me.” He lived what he preached, and his very presence was a living inspiration. His visits to our parishes filled us with gladness and motivated us to keep doing the work of ministry. He never made demands for payment for those visits, though we gladly offered what honorarium what we could. We in the Diocese of the South have lost a great treasure, a true shepherd and father, and now we acutely sense more fully his value as we cope with a series of losses over the past three and a half years. We lost our auxiliary bishop who was to succeed Vladyka Dmitri in November 2008 to another diocese and to the primacy. 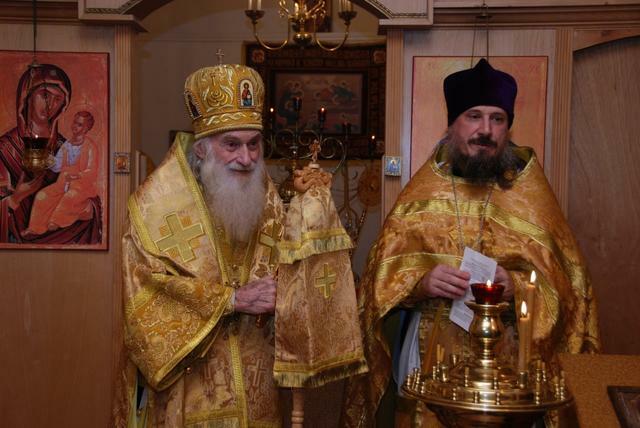 We lost Vladyka as ruling bishop to retirement in February 2009, though he remained with us, and as a temporary consolation, we regained Metropolitan Jonah in the capacity of locum tenens. But our beloved locum tenens was then taken from us a second time in February 2011 and replaced. We suffered loss again when Vladyka Dmitri departed this life on August 28, 2011. We are still mourning these losses. But Vladyka Dmitri’s spirit still infuses us, his example remains before us, his faith still inspires us, and though he has gone on to inherit the heavenly treasure he so abundantly stored up during his life, we have gained an intercessor there for us. We trust God in His wisdom and might to sort out all that now ails us and to raise up the faithful bishop we need to be our father and shepherd here below. Serving Matins this morning for the Leavetaking of the Cross and the Feast of St. Dmitri of Rostov, I was struck by how many of the hymns sung of the great Russian bishop could justly be sung about our own Vladyka Dmitri. The words generated emotion that would make the words stick in my throat. “From thy youth thou didst wholly take upon thyself the search for wisdom and the fear of God, which having found, thou didst not hide in the earth like the slothful servant; but teaching and laboring for Him who gave thee the talent, thou didst increase it a hundredfold, and becamest a great merchant, elucidating the Old and New Testaments, and disclosing the depths of the meaning of the divine written books: and thou hast taught us also to conduct such goodly trade.” And in the words of the canon, we may most fittingly say: “Even though thou hast passed from us to the heavens, O holy hierarch Dmitri, yet dost thou abide in spirit with those who call upon thee, teaching and strengthening them, that they may tread the path of the saving commandments of God.” By his prayers, may we ever faithfully tread that path.